This KOA is located about 18 miles south of Roanoke Rapids and 16 miles north of Rocky Mount, about 1/2 west of I-95 exit 154. The park is clean and well maintained with both shady and sunny sites and level pull throughs in a quiet country setting. This KOA is a great halfway stop on your way to Florida. There is golf, shopping malls and other recreational activities nearby too. Playground, horseshoes and beach volleyball. The park staff is friendly and accommodating. Close enough to I-95 for a convenient overnight stop, yet far enough away to eliminate any highway noise. One of the reasons we stay at KOAs is the consistency of their campgrounds. You know that you’ll get relatively clean, well maintained facilities and amenities… including Free Wi-Fi, which is also important to us. I recommend this KOA if you’re passing thru the area. It makes for a good, easily accessible overnight stop. It’s a pretty campground, but older and many of the facilities should be updated. There’s also no cable or activities. That being said the biggest detraction is the owner. The wifi is listed as included in your rate when you book on the website, however the reality is that the owner and his family will begin pestering you to pay for wifi- at first the reason given is to “save you the trouble of walking down to get the password every day”. If you don’t bite and pay things get quickly uncomfortable and belligerent with phrases like: “we’re not giving out free wifi here!” Getting thrown around. Funny I thought that was all included in the rate that you payed to stay, but apparently not. 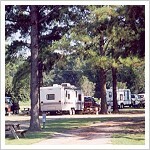 If I could do it again is definitely make the 15 minute drive to the Carolina Crossroads RV park and stay there. I stopped here because it was convenient and it was a KOA. I was very disappointed. I can only review my site, my experience, because there were other sites that seemed to be more level and larger. My assigned site was very narrow, and barely long enough to accommodate my 27 ft trailer and tow vehicle. The site was level side to side, but front to back, I had to extend the front jack to maximum. There was barely enough room to extend the slide out. The electrical connection was worn out, causing a poor connection. Consequently, the plug became very hot when the air conditioner was on. I asked the owner to move to another site. He must have been having a bad day. He seemed to have a chip on his shoulder, and grudgingly agreed. A very unfriendly fellow. The new site wasn’t much better. They do provide internet access, but only for eight hours, then you have to pay $5 a day. This was irritating because I like to look at my hometown newspaper, online, in the morning, but my eight hours had expired. This place is in serious need of some maintenance. This is the worst KOA I have ever been in. I would suggest stopping at the Smithfield KOA instead. A much better RV park. Free wifi is great, and I like it, too, but not at this KOA. The charge is $5.00 per day! Sheesh.